Preventing dental disease begins with your at-home care. It is our goal to make sure that you have all of the best information on how to care for your teeth in between recare visits with us. This will help prevent the development or progression of dental problems. 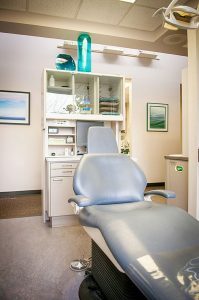 When we see you at our office, we provide a variety of preventative services, including full exams, x-rays, and cleaning and polishing to keep your teeth and gums healthy. Reconstructive dentistry refers to the type of work done by Dr. Gray to rebuild worn or decayed teeth or to replace missing teeth in order to create a functionally sound chewing relationship. This reduces the wear and tear on the teeth and the tempromandibular joint (jaw joint) created when the teeth do not fit together in a harmonious manner. Treatment involves an in-depth evaluation of the way you chew, the health of the jaw joint, and the amount of wear your teeth exhibit. The goal is to repair your teeth in a manner that will reduce or eliminate the factors that caused the destruction. This will allow you to have a comfortable, efficient chewing system that is built to last. Cosmetic dentistry is performed to improve the appearance of your teeth. It may be as simple as lightening the shade of teeth through bleaching, orthodontics to straighten teeth, or porcelain veneers or crowns to improve the shape and possibly the color of your teeth. If your teeth show significant wear, it may be used in conjunction with reconstructive dentistry to improve the appearance of your smile at the same time your bite is corrected. This is usually considered elective in nature. If you do not like the appearance of your teeth, just ask us and Dr. Gray will explain your options. Of the many dental diseases, periodontal disease (often called gum disease) has been shown to have the most significant link to overall health. One of the biggest problems with gum disease is that it is a “quiet” disease. By the time the patient discovers the problem on his or her own, it is usually in the advanced stages. That is because the early symptoms are very minimal and often overlooked by patients. The good news is that the signs of the disease can be detected by our hygienist in its early stages. We use a system developed by the American Academy of Periodontology to assess your risk by measuring both your bone levels and gum recession at each recare visit. Every single tooth and the surrounding gum tissue will have a risk category assigned and documented in your chart, so that we can consistently track even small changes in your bones and gums and treat dental disease in its earliest stages. This system will also determine how long you should go between your recare visits. This is determined by your individual circumstances. This is an exciting time in dentistry. Some of the older dental concepts about risk and prognosis have been either proven incorrect or more commonly, only partially true. We are making important new discoveries and connections about the causes of tooth decay. We now know that the way you chew and what you eat and drink should be significantly incorporated into decisions about your treatment choices. Medical diseases you may have and the medications you take to treat them can also affect your risk for dental disease and the probability of long term success of your treatment. These previously unexplored areas give us new insight into how to improve the health of your teeth and gums in the short-term and long-term. Through extensive postdoctoral continuing education, Dr. Gray and his entire staff are up to date on the newest technologies and products that can enhance your oral health. It has been shown in multiple medical studies that good oral health reduces your risk for complications in many medical situations, such as diabetes, heart health, and the immune system. Our promise to you is that we will bring the newest knowledge and technology in designing your personalized care. CariFree is a new dental product developed from the most current research. We have begun offering this product at our office. It consists of a line of self-care products developed by Dr. Kim Kutsch at the Oregon Health Science University. It has long been known that acid is a major cause of many different dental diseases. Traditionally, a toothbrush and dental floss are the main weapons to break up the acid-producing plaque that builds up on your teeth. Dr. Kutsch approaches it from a different angle. The CariFree products are designed to reduce the overall acid environment found in the mouth. This way, we can fight against acid from all sources, not just from the plaque. Many things can decrease our resistance to dental disease including our diets, acid reflux disease, and even the toothpaste we use. Our hygienists and assistants will gladly introduce you to these new products at your next visit. 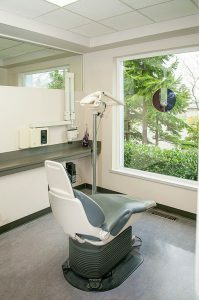 Although Dr. Gray and his clinical team specialize in many different areas of dentistry, there may be some cases where the team will recommend a consultation or a referral to a different dental specialist. Feel comfortable in knowing that these fine practitioners are the same specialists to whom our team would send our own family members. These specialists can include oral surgeons, periodontists, and orthodontists. These referrals will only be made after a thorough consultation between Dr. Gray and you.